San Francisco Squalor: City Streets Strewn With Trash, Needles And Human Feces The city's streets are so filthy that at least one infectious disease expert has compared San Francisco to some of the dirtiest slums in the world. A city sanitation worker gets to work in downtown San Francisco, which says it is expecting its street cleaning budget to be more than $70 million this coming fiscal year. San Francisco's streets are so filthy that at least one infectious disease expert has compared the city to some of the dirtiest slums in the world. San Francisco's new mayor, London Breed, had proposed adding nearly $13 million to the city's $65 million street cleaning budget over the next two years, according to NBC Bay Area. "I will say there is more feces on the sidewalks than I've ever seen growing up here," Breed told NBC Bay Area last month. "We have to make sure people who live here, [and] sadly, people who are homeless here, that they are also held accountable for taking care of our streets. This is our home." 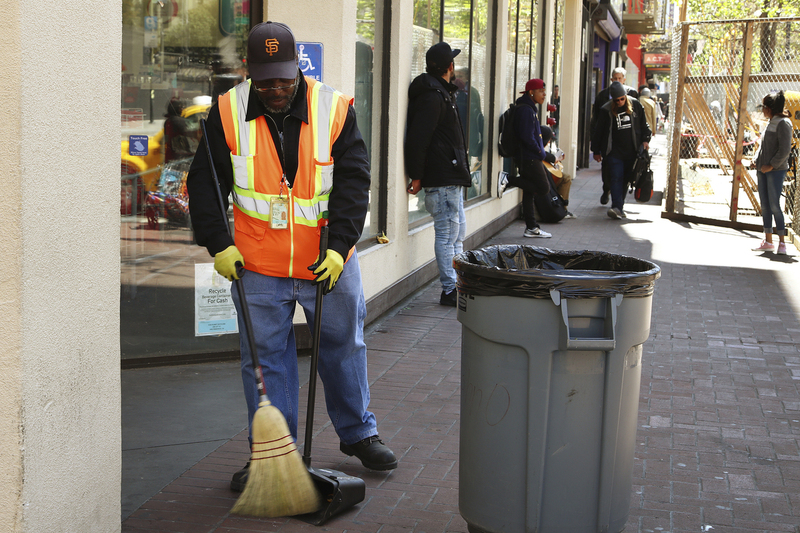 Mohammed Nuru, San Francisco's director of public works, is the city's point man charged with cleaning up the streets. He tells Here & Now's Jeremy Hobson that "it's definitely challenging times" and that the department has been diverted away from normal trash pickup routes into the areas concentrated by people who are homeless. "Our resources have been focused on really trying to clean up areas that mostly have been trashed by homeless, had tents where people [were] living in them," Nuru says. "People were using the streets for the bathroom. ... It creates definitely a different problem." The sprawling California city that is a hub for major tech companies such as Uber and Twitter is being choked by an affordable housing crisis that is pushing more people onto the streets. The 2017 San Francisco Homeless Point-in-Time Count, a report on the city's homeless population, identified 7,499 sheltered and unsheltered homeless people in the city of 884,000. Nearly 49 percent of those were counted in neighborhoods surrounding downtown. San Francisco has become "a magnet" for the homeless because the city has boosted spending to fight the crisis over the past five years, Nuru says. The West Coast cities of Seattle, San Diego and Sacramento, Calif., are also experiencing severe shortages of affordable housing. "A large number of the people we see on our streets are not necessarily from San Francisco," he says. "They are coming from surrounding counties and, in some cases, across state lines." Street conditions in San Francisco are so bad that a Chicago-based medical association recently decided to cancel future events in the city, including a major convention that normally hosts more than 15,000 attendees, according to the San Francisco Travel Association, which declined to name the organization. Nuru says the tourism industry is concerned that street conditions will affect the bottom line. According to the San Francisco Travel Association, spending by tourists reached more than $9 billion in 2017. "We have been working with the convention staff ... our tourist industry and really trying to address the concerns," he says. "I would hope that this is just a short-term type of concern and that we can really get our city to where it should be: a nice clean destination for people who want to come out to the West Coast." A previous version of this story incorrectly said San Francisco's street cleaning budget was $60 million. That number had been from earlier fiscal years. In addition, a previous caption incorrectly said the city is expecting to spend nearly $75 million on street cleaning this year. The proposed number for the coming fiscal year is about $71 million.